A Sunday at Pizza 4P’s Saigon Centre, flickering in tender smoke aroused from the coffee cups around the Bar counter, is the intimate yet exciting discussion about coffee. These people are whom have an intense passion in pursuing the arts of coffee. 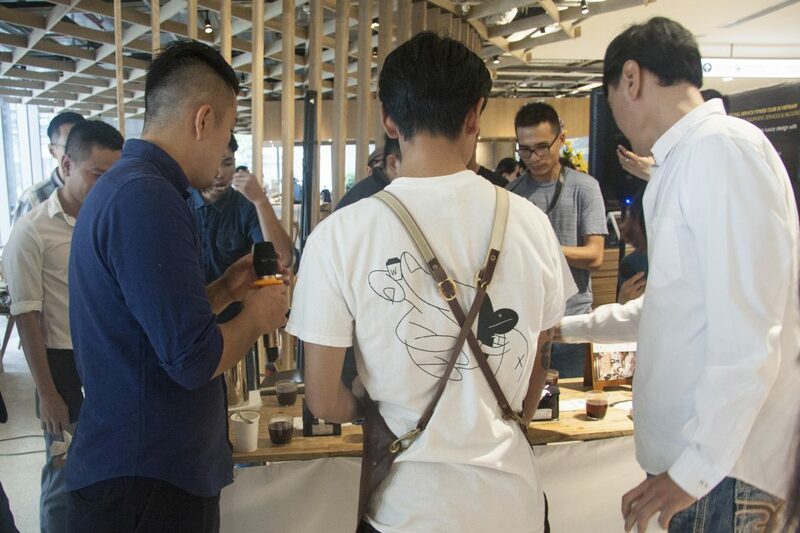 Highlighted in these endless stories, Mr. Atsushi Sakao – founder of ONIBUS | About Life Coffee Brewers, the main character of the event, was handling over coffee to the guests there. 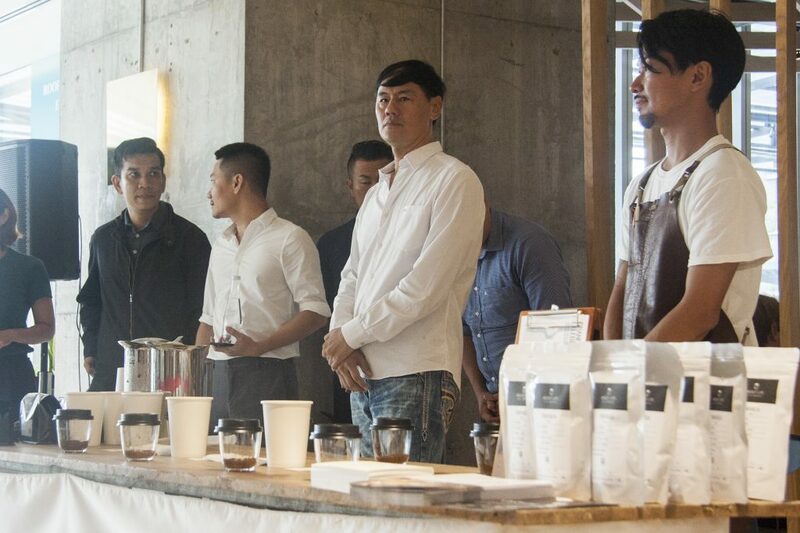 To welcome Pizza 4P’s Grand Opening, we co-operated with About Life Coffee Brewers to hold a Coffee Cupping as well as invited some guests whom have deep understanding and sincere love towards coffee in Vietnam, to join with us. In the field of coffee, the term “Coffee Cupping” refers to tasting the original coffee flavor to evaluate the quality of coffee beans. However, in this cupping session, we only held a small activity through which participants, could share their impressions of the various coffee bean samples grown up in different countries throughout the world. Coffee Cupping process requires many stages, beginning with trying the fragrance of the original coffee roasted beans, then blending them directly by boiling water. Meanwhile, the judges will start smelling the coffee aroma. 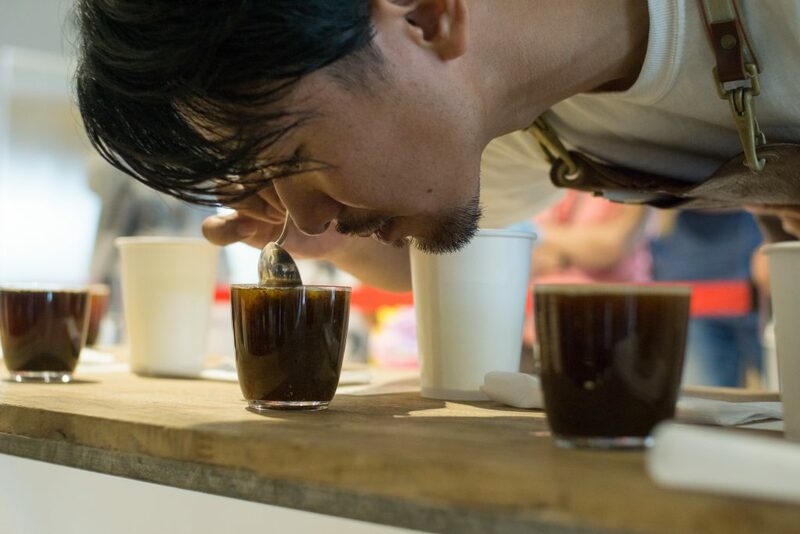 After a couple of minutes, once the coffee settles down, Mr. Sakao will spill out the foam and stir coffee before participants there start exploring the taste hints behind these coffee with a special spoon. In order to maintain the same coffee quality, the whole procedure was only proceeded by Mr. Sakao. In this Coffee Cupping, About Life Coffee Brewers brought four kinds of coffee beans, from Guatemala, Kenya, Ethiopia and Rwanda. Particularly, throughout the process, to ensure the evaluation is objective, not until the last minutes did the origin of the coffee beans was disclosed. Instead, they are numbered from 01 to 04. Most of the judges were particularly impressed with the coffee flavor from Kenya. The general remarks for this type of coffee are the natural sweet and the flexible transformation of many subtle aroma. Meanwhile, two other candidates from Guatemala and Ethiopia are considered to have a pure roasting process that still retains a clean, rustic and authentic flavour. Finally, Rwanda coffee is considered to have a resonant flavor and bring up a depth in feeling. During the session, Mr. Sakao also shared the story which brought him to roasted coffee. 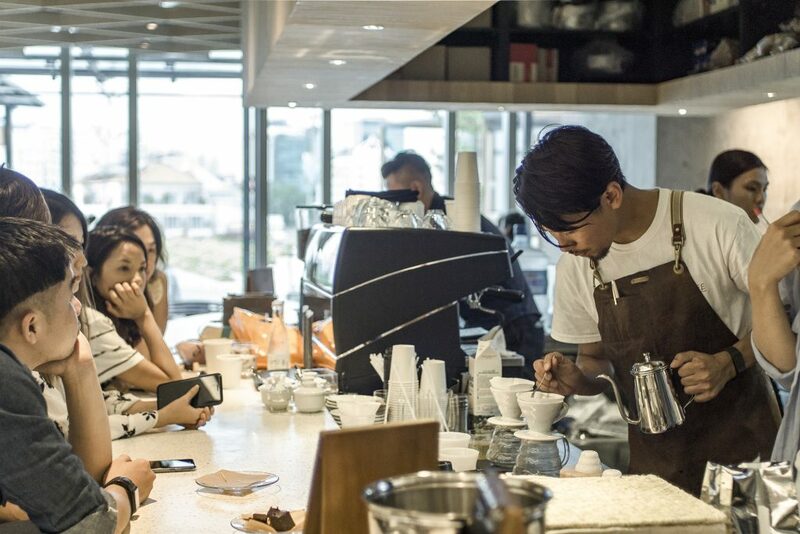 During his travel to Australia, he was amazed by the coffee culture here. 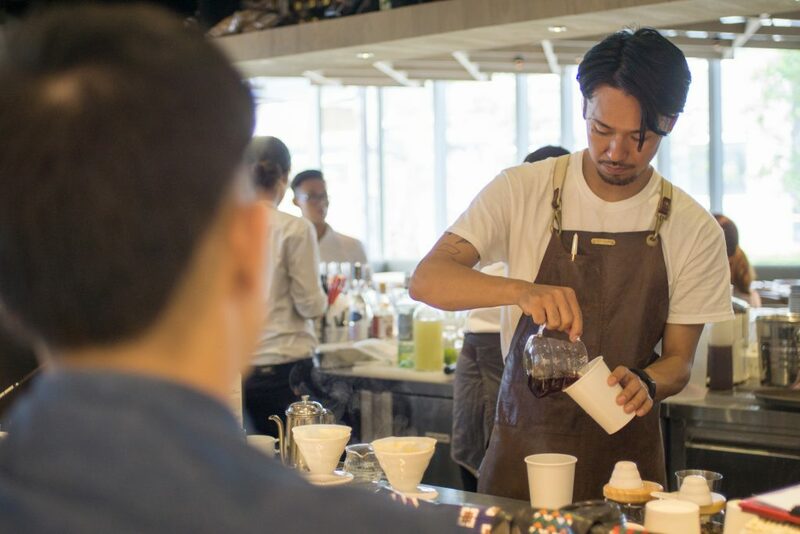 Thus, when returning home, with his initial passion, he started working at a famous coffee shop in Japan while continuing researching in coffee field in his hometown. However, at that time, specialty coffee was not popular in Japan and the information was still very limited. Therefore, he went to some famous coffee cultivars to learn, study and explore the coffee culture right on the farm. From the experiences and practical lessons which he earned himself did support him a lot in his path. We are honored to be a partner with Mr. Sakao and About Life Coffee Brewers in this event as well as together share the meaningful message of connecting people behind the name ONIBUS COFFEE. Through the warmth from the coffee cups, this activity brought an intimate and cozy atmosphere to Pizza 4P’s Saigon Center’s Grand Openning. After Coffee Cupping, we also serve selected coffee from a variety of lands and climates at Pizza 4P’s Saigon Coffee. 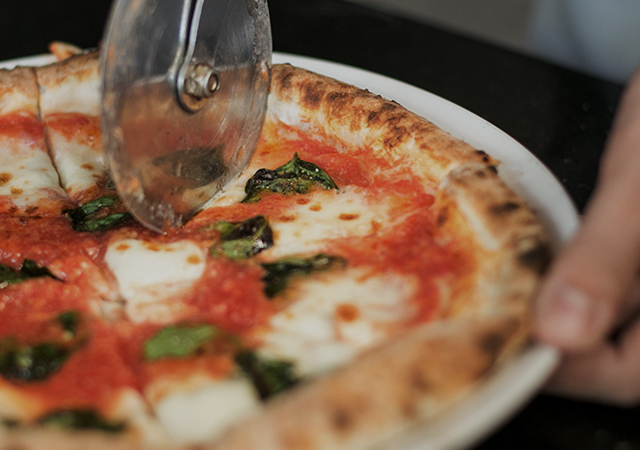 Through this event, Pizza 4P’s is honored to introduce and bring up a richer culinary experience to you.